Yesterday was my second day at the festival. 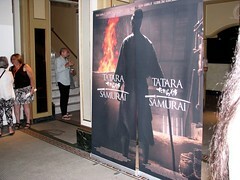 I went to see Tatara Samurai in the early evening. It was the premiere of the movie so the crew (the director and the two main actors) arrived in great pomp with a limo and the red carpet. There was lots of people and the main floor of the Imperial Theatre was almost full (which means about 300~400 people). It was a beautiful and excellent samurai movie that reminded me a little of Kurosawa. Unfortunately, the more I like a movie the more I find difficult to talk about it. But don't worry, I'll manage to organize my notes (as well as edit the video of the screening intro and small Q&A session — taken this time with my old and more reliable camera) in the next few days in order to eventually share them with you. Yesterday afternoon, I also posted online my comment on the movie The Seal of the Sun. It is really damn difficult to do any planning during this festival. You think that you finally have your stuff organized, you ask for a day off work and then, bang!, they change the schedule. Again. I really hate this situation. You really need to check the screening schedule every day (in the evening and in the morning)! The next Japanese movie to be shown will be tonight and then, so far, there's nothing until next week-end — but note that the movie planned for Saturday night, Her Love Boils Bathwater, is CANCELLED! Black Widow Business (後妻業 の 女 / Gosaigyō no onna / lit. "Woman of the second wife industry") : Japan, 2016, 128 min. ; Dir./Scr. : Yasuo Tsuruhashi (based on the novel by Hiroyuki Kurokawa); Cast: Masatoshi Nagase, Masatô Ibu, Machiko Ono. With 4000 matchmaking agencies across Japan serving some 600,000 clients, especially men and women over 65, the pickings are ripe for “black widows”. But the daughter of one victim decides to investigate. The presence of Isabelle Adjani (as well as the screening of her film Carole Matthieu) has been postponed at the request of the French actress. No new screening date has been announced yet. Fortunately there's not only bad news in the festival. It was announced that, out of sheer compassion for movie-makers and movie-goers, from today until next Sunday the Théatre Outremont (1248 avenue Bernard Ouest, near metro Outremont) will start showing movies for the Festival, effectively doubling the number of screens available! Schedule will be announced day by day, but so far today there's no Japanese movies being shown. Anyway, enjoy the festival while you can because it might very well be the last!